This extensive set of free printable materials has lots of wonderful activities for Spanish language learners. 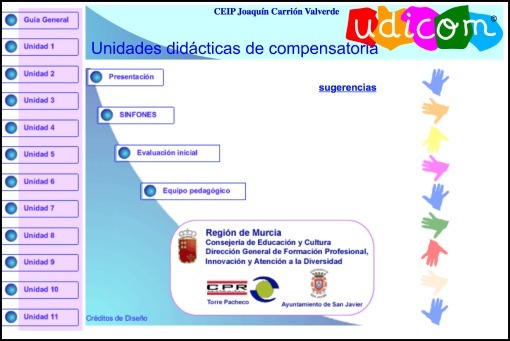 It is offered by Udicom on the educational portal Educarm of the Department of Education in Murcia, Spain. These printable PDFs are designed for native Spanish speakers with a focus on language in context. The set includes a variety of activities that can be used with Spanish language learners at different levels. These materials are divided into 11 units. Each unit is divided into 6 sections with many different activities. Each unit also includes sets of activities for several letters. The first section in each unit, Bloque 1, begins with a vocabulary list and picture cards with the image, the word in print and the word in cursive. These are followed by vocabulary exercises like crossing out the picture that does not belong, cutting and pasting into categories and ordering a series of pictures. All the sections in a unit have exercises for beginning readers like matching the picture to the word, categorizing, completing the word, ordering syllables, and puzzles like crosswords and wordsearches. In addition, there is practice with basic grammar points like gender and articles (el or la) and forming plurals. There are also activities with basic concepts like shapes, colors, and size. The exercises are from Spain, so some of the words, nouns in particular, differ from what is used in Latin America. However, the vast majority of the vocabulary is standard. There is a lot of material in these units and much of it will be useful to teachers and parents working with Spanish language learners.